Perhaps because I just finished Longbourn and have just started Year of Wonders, servants are on my mind. In the family portrait at left, the servants are visible (just) to the right of the tree. The man and woman almost literally mirror the main subjects, Carel Rutger Reinier van B can Ramerus and his wife, positioned as they are in opposite relationship to each other. The servants, too, are surrounded with life, carrying a child and dogs and game. The woman is holding the infant of the van Ramerus couple, and even without Google Translate (that’s “four of their children”) we can figure this out. How? Because the child is held away from her body, and faces forward. 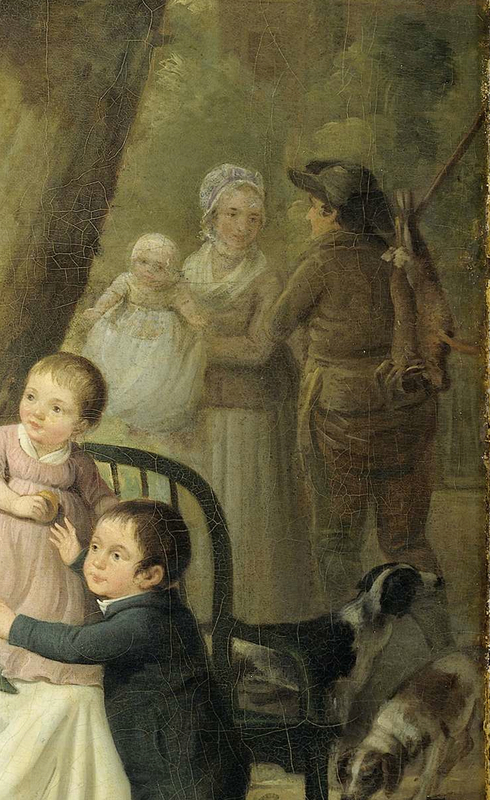 It is a slightly odd arrangement, with the infant so peripheral to the main image, but we’re fortunate, because this composition allows us to see the servants. 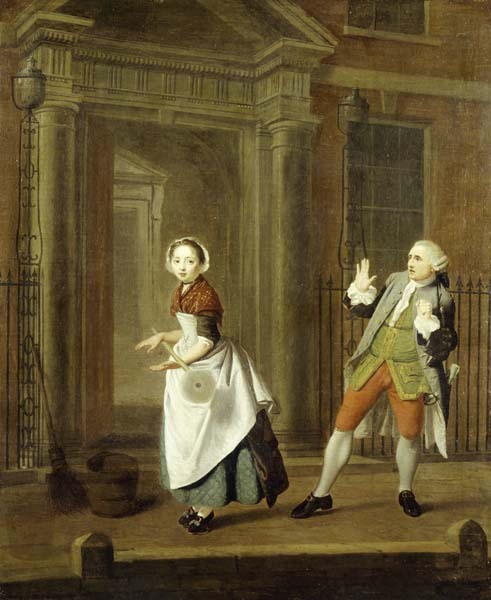 Class distinctions are clear in the dress: the female servant wears a cap, kerchief and short gown, the male servant-gamekeeper, perhaps–wears breeches and a jacket from the pervious century, as well as a cocked, and not a tall, hat. It does remind me strongly of the imperative to continue a family line, and the lot of women to breed and produce male heirs. For all that I love the past, I know I could not live there easily. On Sunday, I read the NYT review of Jo Baker’s new book, Longbourn. As soon as I finished the review, I ordered the book, which arrived Wednesday evening. By 2:00 AM Thursday, I had finished it. The story was engaging–heck, I stayed up until 2:00AM to find out how it ended–and while I found it slightly romantic for my taste, on the whole, the world was believable. For one thing, there is plenty of mud. 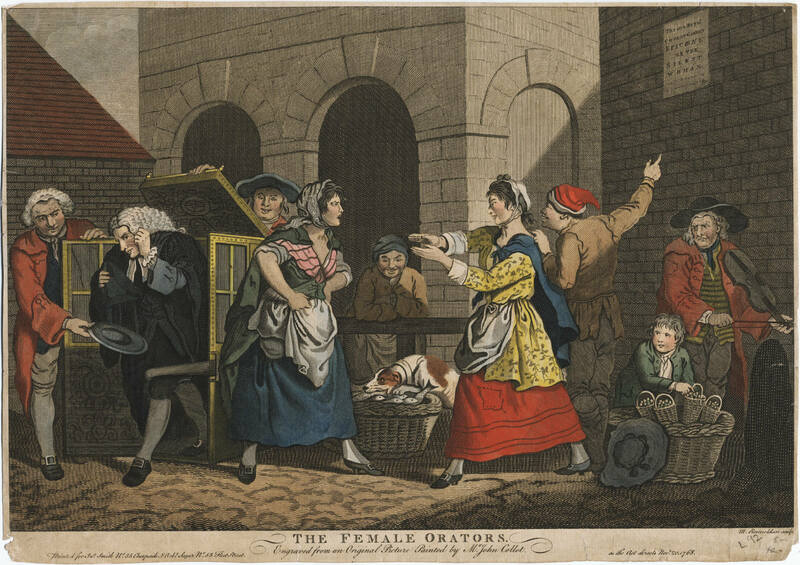 And Sarah the housemaid must clean the mud off the Bennett girls’ petticoats. The hauling of water, laying of fires, and the chill and exhaustion the maids feel is pretty well rendered. Baker addresses the question I’ve always had, How did servants tolerate servitude? by portraying Sarah’s struggle with resentment and resignation to her lot. I thought, too, that the way Baker described women as “breeding” was also good; she referred as well to Elizabeth Bennett’s “dark, musky” armpits, and that seemed a nice way to slip in historical hygiene information. But women in English gentry were valued for their breeding capabilities: the need for a male heir didn’t die with Henry VIII, and it is much of what drives, or drove, the plot of Downton Abbey. For women, the past was a smaller world, and Sarah’s life is particularly small. Her carriage rides help define the very real confinement of her world. Jo Baker’s not Hilary Mantel-– this isn’t the kind of writing where the language stops you cold and sentences leave you breathless with awe, but for historical fiction derived from Jane Austen, Baker’s book is excellent and well-written. Sarah Brown had a sister, Ruth Smith. 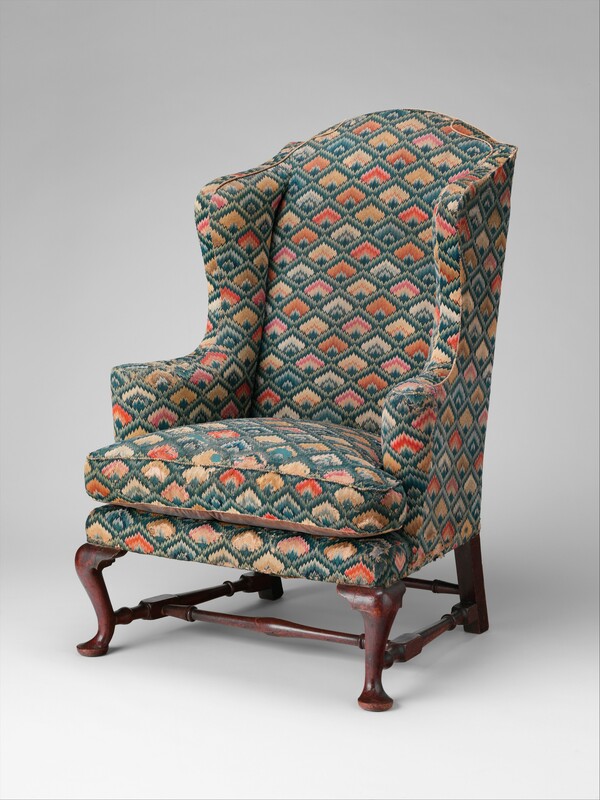 Ruth was good with a needle, and there is an extant chair seat made by Ruth. I’d always thought, in a fuzzy, not-thinking-too-hard kind of way, that Ruth had made the chair seat for her sister and brother-in-law because they were family, and how else would a lady spend her time but with her needle? Yes, she did. In Ruth Smith’s 1785 daybook there are two entries, though the pages are lined for more. The first records 5 shirts made for John Brown February; against this, in March, Ruth received a pair of shoes, and a pound of Hyson tea. In April, she made 4 shirts for John Brown’s son, James; in May, she received 9 yards of lutestring from James. The values didn’t seem to quite line up, so I’ll have to pull the day book again, but what seemed most important was Ruth’s trading shirts for shoes, silk, and tea. In “Dress of the People,” John Styles writes about servants drawing goods from merchants on their masters’ credit; did this transactional relationship allow Ruth wider access to the world of goods than her means might otherwise allow? And if Ruth makes shirts for John and James, are there other, less-well-off relations doing other work for the Browns? There are records of servants or slaves of African descent working in the house on Power Street, but we can only find evidence of three, one dedicated to the horses. That’s not nearly enough people to run a house with a dozen fireplaces and a kitchen, and six or seven occupants. It seems unfathomable that the Browns tended their fireplaces, hauled their water and cooked all their food themselves. John Brown writes to a daughter of “your Marr baking pies,” but it seems radically unlikely that Mrs John Brown, wife of the wealthiest man in Providence, would handle the heavy round of chores required to keep a household and its visitors fed, clothed, cleaned, and entertained. Direct it, yes. Do it all herself, no. What this means, as always, is more research and more looking. It also means that the relationships between Mrs Brown and her ‘maids’ might be more complicated and more interesting. She knows these women, and their families, and how they fit into her world and her family. Could one be a distant cousin, a daughter of a mother no longer living, whose father is abroad, perhaps on a boat owned by John Brown or his companies? Might a young, unmarried woman in her twenties exchange work for room and board and credit with Brown & Francis? Perhaps. That takes care of one or two of us–I’m looking for a widowed niece, with a son gone to sea on a Brown ship to India. Mr S will have to tell me which battle he wants to widow me in, as he has rejected “lost at sea” and “frozen to death on the Oswego expedition” as possibilities. Actually, at my advanced age, I might have been widowed twice already. You’d think I would have done better with it. I started thinking about calico jackets, short gowns, and bed gowns because OSV is around the corner, and it will be hot. At Dighton, I took off my jacket and worked in my stays because it was cooler, and at OSV I may wish to do the same thing cooking or washing. And what better thing to make than a jacket or short- or bed gown which takes little fabric and not much time. For short gown/bed gown patterns, I’d been looking at Duran Textiles’ Newsletter, even though it is European. The general principles are the same, and I need to tweak my pattern as I don’t like the fit over the petticoat in the back. And then I looked at images of women in bed gowns, and the paintings by Chardin, (above, 1738, right, 1747) show women in short garments over petticoats. Lovely. The rich solid of the brown with madder and the print are both attractive and practical, and I have a madder petticoat and pink striped petticoat. I could easily be a Chardin. To get more grounded, North American Colony-based ideas, I looked through my Vogue for the Lower Sorts, Wenches Wives and Servant Girls, and found a woman running away in a Dutch calico jacket or short gown. 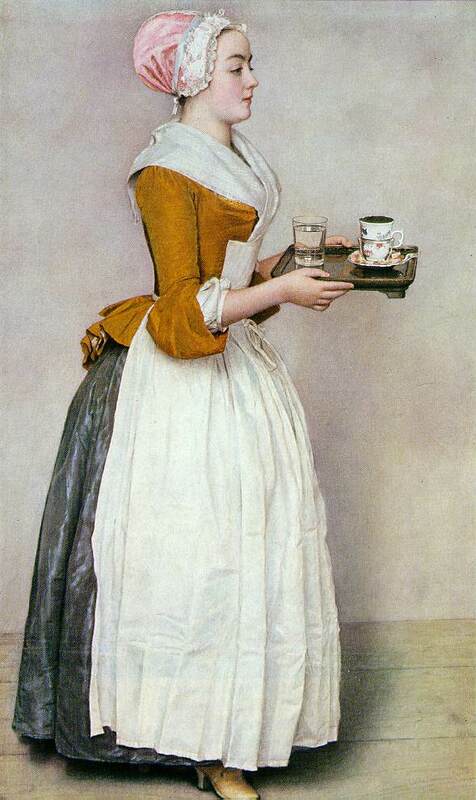 She is a Dutch bound servant, but Catharine Mum takes off in New York with “a callicoe short gown, a green camblet gown, two striped camblet petticoats, a Dutch chintz jacket, one white and some ozenbrig aprons, a black bonnet…” and is described in an ad in the New York Gazette, 17 January 1774 (WWSG, p. 69). In Pennsylvania, a Dutch servant girl takes off in a Dutch jacket and a striped lincey petticoat (Pennsylvania Gazette, 30 March 1774, WWSG, p. 74). Is this Dutch chintz? Snowshill calls this a caraco, 1780-1800. Is it? It is a jacket? Is it a gown that is short? Is the blue Dutch jacket blue chintz, or is the style Dutch? What are the links between the 1747 Chardin, the woman running away in 1774 New York wearing Dutch chintz, and the ca. 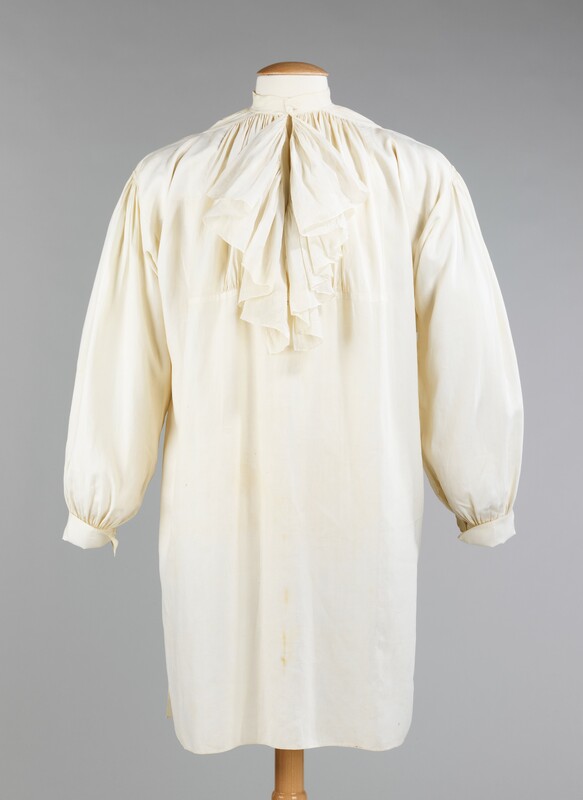 1780 Snowshill garment? Maybe there aren’t any, but it seems like there is a thread of some kind, though it may be a twisted and evolving thread. None of this answers or solves my very local working fashion dilemma, except that I feel more confident that a short, skirted garment made of patterned cotton is a reasonable garment to make. I chose some kalam kari fabric and we shall see what I can make.